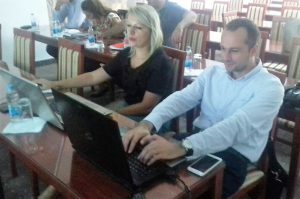 The final joint workshop of development teams of municipalities of Derventa, Prnjavor and Laktasi, which is implemented within the LocalInterAct Network project, was held in Laktaši on 10 July 2018. Analyzes of the municipal economies for 2015, 2016 and 2017 were presented to the members of the project teams, and afterwards representatives of the municipalities have prepared description of situation in the local economies and trends for 2017. It was agreed that the development teams finalize their reports in cooperation with the consultant by mid July 2018. In this way, activities related to quantitative research and analyses will be finalized and municipal representatives will be trained for application of new tools and techniques in analysis of situation and trends in the local economies.